At first blush, intimacy is a strange word to use in a business context. "What, I’m supposed to intimate with my clients?" In the sense that being intimate means being familiar, informal, and emotionally connected…yes, indeed. Intimacy is one of the four components of the Trust Equation and it usually gets the short-shrift. For most, it’s more natural to build trust by increasing credibility and reliability. 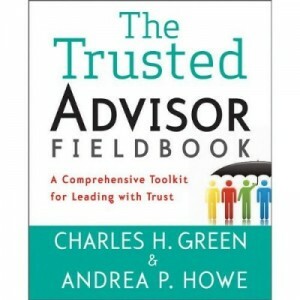 And yet, without intimacy, business transactions are just that–transactions–and the "safe haven" experience that is the hallmark of Trusted Advisor relationships is a pipe dream. Here is a Top 10 list of intimacy-builders to help answer the question, "How do I build intimacy with my clients?" Caveat: While the three groupings (Be Positive, Be Personal, Be Bold) are relatively universal, the specifics underneath are written from a U.S. orientation (mine) and should be adapted as appropriate to fit different cultural norms. 1. Tell your client something you appreciate about him. Don’t just think it; say it. "Amal, before we dig into our agenda today, I just wanted to say I really appreciate how you handled the meeting yesterday. You were clear and direct while also listening to the concerns that were raised. I think it made a difference for the staff." 2. Celebrate successes together. Give the tendency to be a Task Master a little reprieve. Suggest meetings, coffees, lunches–whatever–that are specifically focused on reflecting on/toasting a job well done. 3. Use your client’s name when you communicate with him/her. They say your own name is the sweetest music to your ears. Address your client personally in your emails, voicemails, and conversations. 4. Use colloquial language. Check the consulting jargon and multi-syllablic words at the door. Practice human talk. Simple. Straightforward. To the point. 6. Be willing to express your own emotions. They’re legit too. "Gee, Johannes, I must confess to feeling pretty frustrated by what you just said" or "You have no idea how happy I am to hear that." 7. Share something personal. The next time you’re doing the Monday morning how-was-your-weekend-fine-thanks-yours bit, don’t let it stop at a superficial exchange. "My weekend was great, Surita, thanks for asking. My parents were in town and Sam and I really enjoyed the built-in babysitting. We got a much-needed break." 8. Acknowledge uncomfortable situations. Caveats are conversational jewels: "Wow, this is awkward…" or "I wish I had better news…" or "The timing with this is embarrassing…"
9. Say what needs to be said. Practice doing it in 10 words or less. "We’re not going to make the deadline" or "We just don’t have the executive sponsorship we need" or "Jim is leaving the team." The direct approach works especially well in combination with caveats (see #8). 10. Take responsibility for mistakes. Yeah, it’s risky. It’s also human (we all make ’em) and refreshingly real. "Janet, part of the problem here is that I dropped the ball." Of course, none of these "techniques" creates intimacy if they’re forced or disingenuous or robotic. It’s okay (and perfectly natural) to be a little awkward and unpolished–in fact, that just creates more intimacy.